Radical plans to pedestrianise Oxford Street are set to get underway next year to provide a traffic-free space in central London in time for the full launch of Elizabeth Line services. London mayor Sadiq Khan and the deputy leader of Westminster City Council Robert Davis, announced the plans this morning to banish buses and black cabs among other forms of transport, as east-west traffic will be restricted from entering Oxford Street between Orchard Street and Oxford Circus. The plans are intended to address air quality concerns, the high frequency of collisions – around 60 a year, and severe overcrowding during the busiest parts of the day. The introduction of the Elizabeth Line is expected to significantly increase visitor numbers in the area, according to Transport for London. They will be publicly consulted on until 17 December, with a view to creating a traffic-free area in the West End by December 2018. 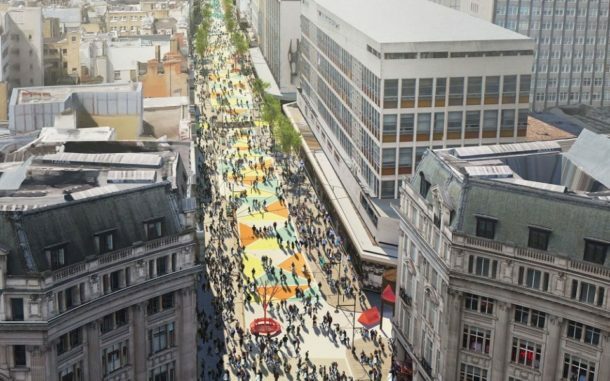 Oxford Street is world famous with millions of visitors every year, and in just over a year the iconic part of the street west of Oxford Circus could be transformed into a traffic-free pedestrian boulevard. Whether you’re a local resident, a business, or shop in some of the area’s famous stores, our plans will make the area substantially cleaner and safer for everyone, creating one of the finest public spaces in the world. The mayor said he will continue to work closely with residents, businesses and Westminster Council “to ensure the plans are the very best they can be”. Cyclists will be required to dismount when travelling the section of street affected, and new and extended taxi ranks will be created near to Oxford Street for cabs to pick up and drop off customers. TfL has already been working to slash the number of buses operating along Oxford Street by 40 per cent, and the opening of the Elizabeth Line will see that reduced to just two routes which will be redirected to operate along Wigmore Street, Henrietta Place and Cavendish Square. The transformation of Oxford Street overall is expected to be delivered in three phases, with the section between Oxford Circus and Tottenham Court Road following after the first phase, and then the section between Marble Arch and Orchard Street. The full revamp, potentially funded by the government and major local landowners and employers in the area, would look to be in place by 2021. Some 3.5m people visit Oxford Street each week, and the Bond Street, Oxford Street and Regent Street area alone contributes around £7.6bn each year to the UK economy, so the hope is that this will be boosted further by making the shopping hub somewhere people want to spend more time. The Licensed Taxi Drivers’ Association expressed its disappointment at the plans. However, TfL commissioner Mike Brown told City A.M. that taxis will have “decent access” in the Oxford Street area, with increased taxi ranks nearby. He also pointed out that “all of the Elizabeth Line stations will be fully accessible and step free”, improving how people can get in and out of Oxford Street.